St. Clair's Defeat also known as the Battle of the Wabash, the Battle of Wabash River or the Battle of a Thousand Slain, was a battle fought on November 4, 1791 in the Northwest Territory of the United States of America. The U.S. Army faced the Western Confederacy of Native Americans, as part of the Northwest Indian War. It was "the most decisive defeat in the history of the American military." It was the largest victory ever won by Native Americans. The natives were led by Little Turtle of the Miamis, Blue Jacket of the Shawnees and Buckongahelas of the Delawares (Lenape). The war party numbered more than one thousand warriors, including a large number of Potawatomis from eastern Michigan and the Saint Joseph. The opposing force of about 1,000 Americans was led by General Arthur St. Clair. The forces of the American Indian confederacy attacked at dawn, taking St. Clair's men by surprise. Of the 1,000 officers and men that St. Clair led into battle, only 24 escaped unharmed. As a result, President George Washington forced St. Clair to resign his post and Congress initiated its first investigation of the executive branch. The 1783 Treaty of Paris, which ended the American Revolutionary War (a war in which Native American tribes were overwhelmingly allied with the British and were treated as defeated powers, following the American victory over the British), recognized United States sovereignty of all the land east of the Mississippi River and south of the Great Lakes. The native tribes in the Old Northwest, however, were not parties to this treaty and many of them, especially leaders such as Little Turtle and Blue Jacket, refused to recognize American claims to the area northwest of the Ohio River. The young United States government, deeply in debt following the Revolutionary War and lacking the authority to tax under the Articles of Confederation, planned to raise funds via the methodical sale of land in the Northwest Territory. This plan necessarily called for the removal of both Native American villages and squatters. During the mid and late 1780s, American settlers in Kentucky and travelers on and north of the river suffered approximately 1,500 deaths during the ongoing hostilities, in which white settlers often retaliated against Indians. The cycle of violence threatened to deter settlement of the newly acquired territory, so John Cleves Symmes and Jonathan Dayton petitioned President Washington and his Secretary of War, Henry Knox, to use military force to crush the Miami. A force of 1,453 men (320 regulars from the First American Regiment and 1,133 militia) under Brigadier General Josiah Harmar marched northwards from Fort Washington on the Ohio River at 10:00 a.m. on October 7, 1790. On October 22, near present-day Fort Wayne, Indiana, Harmar committed only 400 of his men under Col. John Hardin to attack an Indian force of some 1,100 warriors. When a courier informed Harmar (rumored to be drunk) of the size of the enemy force, out of fear he refused to come to Hardin's aid. Had he supported Colonel Hardin with the other 800-900 men, the indigenous force might have been defeated. Instead, Harmar formed his portion of the army into a hollow defensive square and did not move. Hardin, expecting reinforcements, put up a fight for over three hours, then fell back to the main army's encampment and Harmar ordered a retreat back to Ft. Washington. (See main article: Hardin's Defeat). At least 129 of Hardin's soldiers (14 officers, 115 enlisted) were killed in action and another 94 wounded, for a total of 223 casualties. Estimates of total Native casualties, killed and wounded, range from 120 to 150. President George Washington then ordered General Arthur St. Clair, who served both as governor of the Northwest Territory and as a major general in the Army, to mount a more vigorous effort by summer 1791. Congress agreed to raise a second regiment of Regular soldiers for six months, but it later reduced soldiers' pay. The demoralized First Regiment was soon reduced to 299 soldiers, while the new Second Regiment was only able to recruit half of their authorized soldiers. St. Clair was forced to augment his Army with Kentucky militia as well as two regiments (five battalions) of six-month levies. This lithograph of Little Turtle is reputedly based upon a lost portrait by Gilbert Stuart, destroyed when the British burned Washington, D.C. in 1814. While Washington was adamant that St. Clair move north in the summer months, various logistics and supply problems greatly slowed his preparations in Fort Washington (present-day Cincinnati, Ohio). The new recruits were poorly trained and disciplined, the food supplies substandard and the horses, low in number, were of poor quality. The expedition thus failed to set out until October 1791. Building supply posts as it advanced, the Army's objective was the town of Kekionga, the capital of the Miami tribe, near present-day Fort Wayne, Indiana. The Army under St. Clair included 600 regulars, 800 six-month conscripts, and 600 militia at its peak, a total of around 2,000 men. Desertion took its toll and when the force finally got underway, it had dwindled to around 1,486 total men and some 200-250 camp followers (wives, children, laundresses and prostitutes). Going was slow and discipline problems were severe; St. Clair, suffering from gout, had difficulty maintaining order, especially among the militia and the new levies. The force was constantly shadowed by Indians and skirmishes occasionally erupted. By the end of November 2, through desertion and illness, St. Clair's force had been whittled down to around 1,120, including the camp followers. He had 52 officers and 868 enlisted and militia present for duty on November 3. The force camped on an elevated meadow, but did not construct any defensive works, even though natives had been seen in the forest. While St. Clair's Army continued to lose soldiers, the Western Confederacy quickly added numbers. 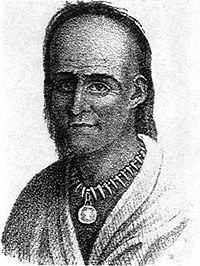 Buckongahelas led his 480 men to join the 700 warriors of Little Turtle and Blue Jacket, bringing the war party to more than one thousand warriors, including a large number of Potawatomis from eastern Michigan and the Saint Joseph. St. Clair's Defeat. a-Butler's Battalion, c-Clarke's Battalion, d-Patterson's Battalion, e-Faulkner's Rifle Company, h-Gaither's Battalion, j-Beddinger's Battalion, crosses indicate the "enemy", z-"troops retreating"
Illustration from Theodore Roosevelt's article on St. Clair's Defeat, featured in Harper's New Monthly Magazine, February 1896. On the evening of 3 November, St. Clair's force established a camp on a high hill near the present-day location of Fort Recovery, Ohio, near the headwaters of the Wabash River. A native force consisting of around 1,000 warriors, led by Little Turtle and Blue Jacket, waited in the woods until dawn, when the men stacked their weapons and paraded to their morning meals. Adjutant General Winthrop Sargent had just reprimanded the militia for failing to conduct reconnaissance patrols when the natives then struck, surprising the Americans and overrunning their ground. Little Turtle directed the first attack at the militia, who fled across a stream without their weapons. The regulars immediately broke their musket stacks, formed battle lines and fired a volley into the natives, forcing them back. Little Turtle responded by flanking the regulars and closing in on them. Meanwhile, St. Clair's artillery was stationed on a nearby bluff and was wheeling into position when the gun crews were killed by native marksmen, and the survivors were forced to spike their guns. Colonel William Darke ordered his battalion to fix bayonets and charge the main native position. Little Turtle's forces gave way and retreated to the woods, only to encircle Darke's battalion and destroy it. The bayonet charge was tried numerous times with similar results and the U.S. forces eventually collapsed in disorder. St. Clair had three horses shot out from under him as he tried in vain to rally his men. After three hours of fighting, St. Clair called together the remaining officers and, faced with total annihilation, decided to attempt one last bayonet charge to get through the native line and escape. Supplies and wounded were left in camp. As before, Little Turtle's Army allowed the bayonets to pass through, but this time the men ran for Fort Jefferson. They were pursued by Indians for about three miles before the latter broke off pursuit and returned to loot the camp. Exact numbers of wounded are not known, but it has been reported that execution fires burned for several days afterwards. The casualty rate was the highest percentage ever suffered by a United States Army unit and included St. Clair's second in command.Richard Butler. Of the 52 officers engaged, 39 were killed and 7 wounded; around 88% of all officers became casualties. After two hours St. Clair ordered a retreat, which quickly turned into a rout. "It was, in fact, a flight," St. Clair described a few days later in a letter to the Secretary of War. The American casualty rate, among the soldiers, was 97.4 percent, including 632 of 920 killed (69%) and 264 wounded. Nearly all of the 200 camp followers were slaughtered, for a total of 832 Americans killed. Approximately one-quarter of the entire U.S. Army had been wiped out. Only 24 of the 920 officers and men engaged came out of it unscathed, the survivors included Benjamin Van Cleve and his uncle Robert Benham; van Cleve was one the few who were unharmed. Native casualties were about 61, with at least 21 killed. The number of U.S. soldiers killed during this engagement was more than three times the number the Sioux would kill 85 years later at the Battle of Little Big Horn. The next day the remnants of the force arrived at the nearest U.S. outpost, Fort Jefferson, and from there returned to Fort Washington. The confederacy reveled in their triumph and war trophies, but the majority of the force returned to their respective towns after the victory. The 1791 harvest had been insufficient in the region, and the warriors needed to hunt in order to have enough food stores for winter. A grand council was held on the banks of the Ottawa River to determine whether to continue the war against the United States or negotiate a peace from a strong position. The council delayed the final decision until a new grand council could be held the following year. The British, surprised and delighted at the success of the natives who they may have been supporting and arming for years, stepped up their plans to create an Indian barrier state that would encompass the American Midwestern region from Ohio into Minnesota. The plans were developed in Canada, but in 1794 the government in London reversed course and decided it was necessary to gain American favor, since a major war had broken out with France. London put the barrier state idea on hold, and opened friendly negotiations with the Americans that led to the Jay Treaty of 1794. One provision was that British acceded to American demands to remove their forts from American territory in Michigan and Wisconsin. The British, however, maintained their forts in Ontario, from which they supplied munitions to the natives living in the United States of America. Fort Jefferson did not have adequate supplies for the remaining force under St. Clair, so those who could travel continued their retreat. Many wounded were left behind with no medicine and little food. From Fort Washington, St. Clair sent a supply convoy and a hundred soldiers under Major David Ziegler on November 11. He arrived at Fort Jefferson and found 116 survivors eating "horse flesh and green hides". Charles Scott organized a relief party of Kentucky militia, but they disbanded at Fort Washington in late November with no action taken. Lieutenant Colonel James Wilkinson assumed command of the Second Regiment in January 1792 and led a supply convoy to Fort Jefferson. This detachment attempted to bury the dead and collect the missing cannons, but the task proved to be beyond them, with "upwards of six hundred bodies" at the battle site and at least 78 bodies along the road. President Washington was outraged when he received news of the defeat. St. Clair left Wilkinson in charge of Fort Washington, and arrived in Philadelphia in January 1792 to report on what had happened. Blaming the quartermaster, Samuel Hodgdon, as well as the War Department, the general asked for a court-martial in order to gain exoneration and planned to resign his commission after winning it. Washington, however, denied him the court-martial and forced St. Clair's immediate resignation. The House of Representatives began its own investigation into the disaster. This was the first Congressional Special Committee investigation, as well as the first investigation of the executive branch and as part of the proceedings, the House committee in charge of the investigation sought certain documents from the War Department. Knox brought this matter to Washington's attention and because of the major separation of powers issues involved, the president summoned a meeting of all of his department heads; This was one of the first meetings of all of these officials together and may be considered the beginning of the United States Cabinet. Washington established, in principle, the position that the executive branch should refuse to divulge any papers or materials that the public good required them to keep secret and that at any rate they not provide any originals. This is the earliest appearance of the doctrine of executive privilege, which later became a major separation of powers issue. The final committee report sided largely with St. Clair, finding that Knox, Quartermaster General Samuel Hodgdon and other War Department officials had done a poor job of raising, equipping and supplying St. Clair's expedition. However, Congress voted against a motion to consider the Committee's findings and issued no final report. St. Clair expressed disappointment that his reputation was not officially cleared. Within weeks of learning of the disaster, President Washington wrote "We are involved in actual war!" He urged Congress to raise an army capable of conducting a successful offense against the American Indian confederacy, which it did in March 1792 – establishing additional Army regiments (the Legion of the United States), adding three-year enlistments, and increasing military pay. That May, it also passed two Militia Acts: the first empowered the president to call out the militias of the several states; the second required that every free able-bodied white male citizen of the various states, between the ages of 18 and 45, enroll in the militia of the state in which they reside. Washington would utilize the authority to call out the militia in 1794 to suppress the Whiskey Rebellion in Western Pennsylvania. In late 1793, the Legion of the United States, under Major General "Mad Anthony" Wayne, began construction of Fort Recovery at the location of St. Clair's defeat; and, on June 30 – July 1, 1794, successfully defended it from an Indian attack. Later that month, the legion won a decisive victory in the Battle of Fallen Timbers, resulting in the 1795 Treaty of Greenville that brought an end to the Northwest Indian War. A story was published years after the defeat of St Clair about a skeleton of a Captain Roger Vanderberg and his diary that were supposedly found inside a tree in Miami County, Ohio. However, no one of that name was a casualty of the 1791 battle. The story originated in 1864 and was actually taken from a Scottish novel. A folk ballad, "St. Clair's Defeat" (or "Sinclair's Defeat"), was published in the 19th century; Anne Grimes' quotes Recollections of Persons and Places in the West by Henry M. Brackenridge, 1834, in which Brackenridge recalled hearing the song from its author, a blind poet named Dennis Loughey, at a racetrack in Pittsburgh around 1800. It was collected as a folksong in Mary O. Eddy's 1939 book Ballads and Songs from Ohio. It was recorded by Anne Grimes on her 1957 album, Ohio State Ballads and by Bob Gibson and Hamilton Camp on their 1960 album Gibson & Camp at the Gate of Horn. It was also recorded as "St. Claire's Defeat" by the folk revival group the Modern Folk Quartet in 1964 and by Apollo's Fire in 2004. ^ Cornelius, Jim (4 November 2012). "The Battle of a Thousand Slain". FrontierPartisans.com. Retrieved 15 November 2015. ^ Landon Y. Jones (2005). William Clark and the Shaping of the West. p. 41. ^ Waxman, Matthew (November 4, 2018). "Remembering St. Clair's Defeat". Lawfare. ^ a b Fleming, Thomas (August 2009). "Fallen Timbers, Broken Alliance". Military History. History Reference Center, EBSCOhost. 26 (3): 36–43. ^ "Map of St. Clair's Encampment". United States Army Military History Institute. 15 September 2011. Retrieved 22 November 2015. ^ Lossing, Benson (1868). The Pictorial Field-Book of the War of 1812. Harper & Brothers, Publishers. p. 47. ^ a b Buffenbarger, Thomas E. (15 September 2011). "St. Clair's Campaign of 1791: A Defeat in the Wilderness That Helped Forge Today's U.S. Army". U.S. Army Heritage and Education Center. Retrieved 21 November 2015. ^ Casualty statistics from "That Dark and Bloody River", by Allan W. Eckert, Bantam Books, December 1995. ^ Jenkins, Tamahome (18 November 2009). "St. Clair's Defeat and the Birth of Executive Privilege". Babeled.com. Archived from the original on 23 December 2010. Retrieved 3 November 2010. ^ Rosenberg, Morton (2008). "Presidential Claims of Executive Privilege: History, Law, Practice and Recent Developments" (PDF) (RL30319). Congressional Research Service: 1. ^ "Samuel Hodgdon, 5th Quartermaster General". Fort Lee, Virginia: US Army Quartermaster Foundation. Archived from the original on 14 May 2011. Retrieved 9 May 2011. ^ "May 08, 1792: Militia Act establishes conscription under federal law". This Day In History. New York: A&E Networks. 2009. Retrieved July 20, 2017. ^ "Proposed Work at Fort Recovery May Solve Some of its Mysteries see letter in Comments by James L Murphy dated 7 January 2010 citing the story "Lost Sir Massingberd"". Ohio Historical Society Archaeology Blog. 2010-01-06. Retrieved 2018-02-24. ^ Johnson, Sara L. "Sinclair's (St. Clair's) Defeat - The Battle of Pea Ridge". The Kitchen Musician. Retrieved 9 May 2011. ^ Grimes, Anne (1957). Liner Notes, Ohio State Ballads (PDF). Smithsonian Folkways. p. 6. Retrieved 31 May 2015. ^ Brackenridge, Henry M. (1834). Recollections of persons and places in the West (1st ed.). Philadelphia: James Kay Jun. and Brother. p. 73. Retrieved 31 May 2015. ^ Eddy, Mary O. (1939). Ballads and songs from Ohio. New York: J.J. Augustin. ^ Grimes, Anne (1957). "St. Clair's Defeat - Ohio State Ballads". Smithsonian Folkways. Retrieved 30 May 2015. Calloway, Colin Gordon (2015). The Victory with No Name: the Native American Defeat of the First American Army. Oxford: Oxford University Press. ISBN 978-01993-8799-1. Eid, Leroy V. (1993). "American Indian Military Leadership: St. Clair's 1791 Defeat". Journal of Military History. 57 (1): 71–88. Gaff, Alan D. (2004). Bayonets in the Wilderness. Anthony Wayne's Legion in the Old Northwest. Norman: University of Oklahoma Press. ISBN 0-8061-3585-9. Guthman, William H. (1970). March to Massacre: A History of the First Seven Years of the United States Army. New York: McGraw-Hill. ISBN 0-07-025297-1. Hogeland, William (2017). Autumn of the Black Snake. New York: Farrar, Straus and Giroux. ISBN 9780374107345. LCCN 2016052193. Odo, William O. (1993). "Destined for Defeat: an Analysis of the St. Clair Expedition of 1791". 'Northwest Ohio Quarterly. 65 (2): 68–93. Sugden, John (2000). Blue Jacket: Warrior of the Shawnees. Lincoln and London: University of Nebraska Press. ISBN 0-8032-4288-3. Sword, Wiley (1985). President Washington's Indian War: The Struggle for the Old Northwest, 1790-1795. Norman and London: University of Oklahoma Press. ISBN 0-8061-1864-4. Van Trees, Robert V. (1986). Banks of the Wabash. Fairborn, Ohio: Van Trees Associates. ISBN 0-9616282-3-5. Winkler, John F. (2011). Wabash 1791: St. Clair's Defeat; Osprey Campaign Series #240. Oxford: Osprey Publishing. ISBN 1-84908-676-1.